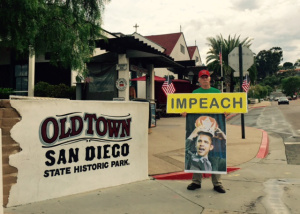 Monthly Protest Report – Impeach Obama NOW! – August, 2015 | Stop Obama Now!! This is a report of impeach Obama protests for August. The purpose is to provide information about protests which are taking place around the country and to encourage more protest efforts. Organize your own protest and join us. The suggested date of the protest is the 1st Saturday of every month. However, if it is not possible to have it on that date, any date you want to do it is also fine.